How Would Multi-Billion Dollar Mortgage Fine Impact RBS’s 2018 Results? Late last week, the Financial Stability Board (FSB) updated its list of global systemically important banks (G-SIBs) based on data for full-year 2017, and The Royal Bank of Scotland Group (NYSE:RBS) is no longer on this list. According to the FSB’s latest assessment of the world’s largest banks, RBS and Nordic banking giant Nordea are no longer big enough to qualify for the G-SIB tag – news that will materially reduce the level of regulatory scrutiny for these banks. As French banking group BPCE returned to the list in 2018 after being left out in 2017, the total number of G-SIBs for the year fell to 29 from 30 last year. Besides these changes, two global banks are now in a different risk category compared to last year, as the FSB now classifies Bank of America (NYSE:BAC) and China Construction Bank (CCB) under a risk category one notch lower. As the mandated minimum capital ratio that a G-SIB needs to maintain is determined by the risk category – or more formally the ‘additional loss absorbency-level bucket’ – in which the FSB places the bank, this would mean a decline in capital requirement levels for these two banks. Below we detail the impact of the new categorization on all these banks – especially on RBS, which can now potentially return to the private sector earlier than we originally forecast in our detailed forecast dashboard for the U.K.-government’s RBS stake sale. We also elaborate on the rationale behind the FSB’s capital requirement guidelines and allocation of individual banks into these buckets while highlighting the major changes in the FSB’s list since 2011 – when the regulator first published its list of G-SIBs. Following the global economic recession, the biggest concern among financial regulators was to ensure that the biggest and most important banks do not buckle under economic pressure the way many did in 2008 when governments were forced to step in and bail them out. The concept of a bank acting as the economic backbone of a region or a nation led to the larger idea of banks which are systemically important on the global scale – the G-SIBs. The FSB, backed by the G20 nations, is charged with overseeing the financial condition of the world’s largest banks – with a specific focus on identifying G-SIBs and coming up with ways to making them as stable as possible. As the biggest global banks are extremely diversified in their operations, and as splitting their traditional lending business from the more volatile investment banking operations comes with a long list of issues, the most acceptable solution for the regulators and the banks was to increase the amount of capital they hold. As a “one-size-fits-all” approach couldn’t be used for all these banks, their capital requirements were staggered by categorizing them on the basis of their business models, geographical diversification, quality of asset base, and a plethora of such factors. The final capital requirement for a particular bank was to be determined as the sum of the minimum level of capital requirement of 7% and an applicable surcharge which was one of five values: 1%, 1.5%, 2%, 2.5% and 3.5%. The highest surcharge of 3.5% was proposed as a deterrent to an extremely large bank from growing any further, and no bank has been categorized in this bucket since the inception of this methodology. As for the other proposed buckets, the FSB rated the G-SIBs based on their inter-connectedness, size, complexity, global reach, and even the ability of other firms to take over their functions in the event of their failure. So, if a bank falls in Bucket 4, then it is mandatory for it to hold an additional 2.5% in capital over and above the 7% base minimum, or a total of 9.5%. Notably, JPMorgan Chase (NYSE:JPM) is the only banking giant still categorized in Bucket 4. The table below summarizes the changes in the FSB’s list of G-SIBs from 2011, and highlights banks that saw a change in their category in 2018 in green. Note: Commerzbank, Dexia and Lloyds were dropped from the list in 2012, Standard Chartered was added in 2012, ICBC in 2013, Agricultural Bank of China (ABC) in 2014 and China Construction Bank (CCB) in 2015. Also, BBVA was added to the list in 2012, but dropped in 2015. BPCE was dropped in 2017, but was added again in 2018. 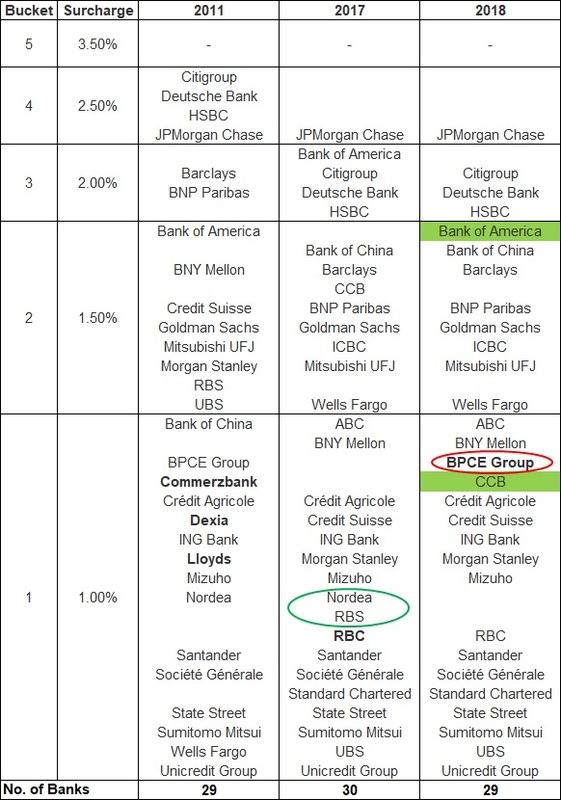 RBS and Nordea were dropped in 2018. The direct impact of the FSB’s new list on Bank of America and CCB is to reduce their mandatory minimum capital ratio requirements by 50 basis points (0.5%). So Bank of America’s minimum capital ratio decreases from 9% to 8.5%, while that for CCB falls from 8.5% to 8%. It should be noted, though, that the capital requirements set by the FSB are generally used as the base minimum figure by country-specific financial regulators. For most U.S. banks, the Federal Reserve prescribes capital surcharges that are above the FSB’s recommendation – with the figure for Bank of America currently being 2.5% (as opposed to 2% suggested by FSB). However, the Fed can potentially reduce Bank of America’s G-SIB surcharge figure to reflect the change in risk category over coming months – a move that can free up a sizable chunk of capital for the bank. This freed-up cash would very likely be used to boost dividend payouts and/or to repurchase stock as a part of the next Fed stress test cycle. Taken together, these factors should have a positive impact on RBS’s share price in the near term. While RBS’s shares currently look undervalued given the uncertainty surrounding Brexit, the British government should resume its stake sale process once the share prices recover. And the improved price outlook is likely to result in the British government selling off a larger chunk of its stake each year – resulting in the stake sale completing at a faster pace than what we initially forecast in our interactive RBS dashboard. We currently forecast that the U.K. Government will completely exit its stake in RBS by 2026, but an improved outlook for RBS’s share price could mean that the bank’s re-privatization process could potentially be completed two years earlier, by 2024. Disagree with our forecasts? Feel free to arrive at your own estimates for RBS by making changes to our dashboard.